The National Institutes of Health has provided an invaluable tool for the proposal writer with its Annotated R01 Grant Application and Summary Statement. The Department of Health and Human Services “NIH RePORTER” (formerly "CRISP") system also allows you to look up proposals that have been funded. The Department of Education has a variety of sample proposals available here. Keep in mind that proposal guidelines may change over time. Something that was permitted under previous solicitations may not be permissible now. 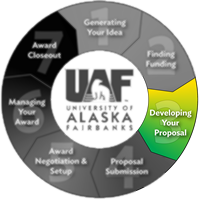 A Practical Guide for Writing Proposals by Alice Reid, M. Ed.